Mobile devices have increased our ability to check on our investments wherever we may be and this trend will continue with the release of the Apple Watch on April 24. 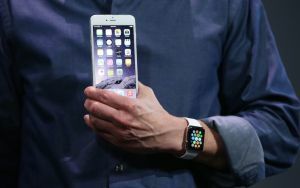 A number of financial companies have sought to lure more money-minded consumers by designing mobile apps to interact with their different types of financial products and now those apps are being modified to be compatible with the Apple Watch. These Apple Watch apps are being created to provide us with essential financial information right on our wrists. Here are some of the great Apple Watch apps that are being designed to help you manage your investments. The portfolio-monitoring app PortfolioWatch is being revamped to be compatible with both the iPhone and the Apple Watch. The Apple Watch app can provide you with a view of an individual stock’s performance both daily and over time, as well as give you a view of your portfolio’s daily performance. Users can see quotes with a flick of their finger, along with a stock’s gain or loss for the day and the total change in price since being added to your portfolio. The app can also be used to monitor stocks like a watch list. Popular personal finance app iBank is also being revamped for use on the Apple Watch. The Apple Watch app is tightly integrated with iBank for iPhone and will provide overall summary information about your finances at a glance, literally. The app’s glance screen will show you how your investments are doing and allow you to check on each item in your investment portfolio. Each screen is badged with appropriate icons to help you quickly determine what account you are viewing at any given time. You can also use the iBank Apple Watch app for budgeting and tracking expenses. Fidelity’s Apple Watch app provides real-time quotes and market information as well as featuring a “market movers” screen dedicated to the most active stocks and the largest winners and losers of the day. Along with the up-to-the-minute stock market data, the app can be programed to send you push notifications for Fidelity orders and price alerts. The app is a great way to review your portfolio without having to fish around for your phone and you can view your financial information more securely than on your laptop or tablet. The company says that the Fidelity app for the Apple watch will be available on the first day the watch is available to the public.